Last month, EdWeek published a Q&A with education technology experts discussing the future of technology use in classrooms. Their comments echoed what I learned during my teacher training: data-driven instruction is essential for student growth, and ed tech is the key to delivering quality, personalized learning. Yet what many of those experts failed to mention is that the best learning technology is only successful if the basic infrastructure is in place — and for rural students, this lack of infrastructure has turned into a technology equity gap. One in five students attends school in a rural district, where teachers often lack access to reliable internet and hardware. Rural schools located in low-socioeconomic communities struggle to provide teachers and students with updated technology. When teachers are able to introduce ed tech into the classroom, the new devices are often not supported with necessary broadband or storage improvements. 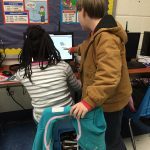 Two of my 4th grade students collaborating in the computer lab. I saw this firsthand as a rural educator in South Carolina, where frequent computer failures made it nearly impossible to implement technology-enabled personalized learning. In my former school district, using ed technology wasn’t just suggested — for many classes, it was required. Each week, my class went to the computer lab to work on a literacy program purchased by the school. When the computers worked, the program was a hit — it allowed my students to advance at their own pace and to focus on personalized standards and skills. Each time we visited the lab, however, a new problem emerged: often, the internet didn’t work at all. If the internet worked, then half of the desktops were down. Sometimes we’d make it all the way through the login stage before the desktops began crashing, and I’d watch as a sea of hands flew up around the room. After five failed visits, I quit going to the lab completely. One-to-one iPad programs and community-wide internet may be part of ed tech’s future, but for my former students, it is far from a working reality. And this isn’t just a rural issue: students and teachers in some underserved urban communities also lack the necessary tech infrastructure. Some districts are taking on this infrastructure challenge: one county in rural Virginia is building a DIY broadband network that will bring internet access to schools and homes in remote areas of the district. Other districts are increasing their broadband capability through the federal government’s E-Rate program, which allows rural schools to apply for technology infrastructure funding. Efforts like these demonstrate that improving a school’s tech infrastructure is a possibility for all schools, regardless of location. As the new school year approaches, principals and administrators will continue looking for ways to bring ed tech into classrooms. While their efforts are valuable, I challenge these leaders to consider if their schools have the necessary technology capability — and if not, how they will first build a working infrastructure to benefit students and teachers alike. All children deserve the opportunity for personalized learning, but until underserved students receive the same basic access as their more affluent peers, the tech equity gap will continue to widen. This entry was posted in Education Innovation, Rural Education and tagged educational technology, equity, rural education, rural schools on July 24, 2017 by Taylor Seale.